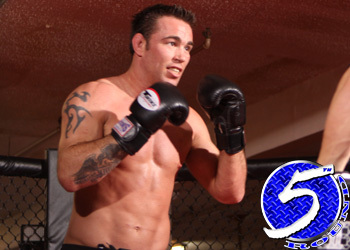 A middleweight tussle between Jake Shields (Pictured) and Ed Herman was the third contest to air live in Saturday’s “UFC 150: Henderson vs. Edgar II” pay-per-view broadcast. Pepsi Center in Denver, Colorado is hosting tonight’s festivities. The show is headlined by a lightweight title rematch between current champ Benson Henderson and Frankie Edgar. Herman is the aggressor in the opening moments. For some reason he decides to play into Shields’ hands by clinching against the cage. Shields trips him to the mat with the greatest of ease. The former Strikeforce champ took his back for a moment, but Herman gets to his feet. Herman is pressing him against the fence. Certainly not the most thrilling scrap of the night, as the crowd boos after the horn sounds. Tough frame to score. Herman immediately clinches him against the cage. Shields makes him pay for it and takes him down. He advances to side control and tries a kimura to no avail. Shields efficiently working his ground-and-pound. Herman manages to get him back into his full guard. The crowd is not happy. In fact, they have been quick to pull the boo trigger all night. Shields’ telegraphed shot gets stuffed. Herman scores with an uppercut in the clinch. Herman tossed him to the ground for a second. Shields grabs a hold of a double-leg and leads his opponent to the canvas. He transitions to side control with half the round to go. Now full mount. Herman probably could have won this fight if he kept it standing, but for some reason opted to clinch with the jiu jitsu ace.